Meena thinks that she has it made when she wins the lotto with her five closest friends. They have big plans and she’s thrilled with the chance to spend more time with her three-year-old son, Deven and create her one-of-a-kind jewelry pieces. But then the emails start coming. Her new pen pal is totally devoted, and totally freaking her out. She already gets recognized for winning the lotto, and this makes her even more paranoid about going out in public. Army Paratrooper Kaleb Muller is thrilled when he runs into Meena while he’s off his Army base running errands in Leavenworth. He tells himself he just wants to make sure his best friend’s widow is okay, but when he spends time with her and Deven, he realizes the feelings for her that he had been trying to ignore are still there. When he learns about the stalker, he’s determined to help. If he can get to her see him as more than a friend along the way, all the better. I loved reading this book! Heather Tullis has a way with the characters she writes about, they are always amazing. And she knows how to add the perfect amount of suspense. I’m always left guessing when reading her books. Meena is a great character. I loved her in this one. I loved the way she cared for her little boy, Deven, all on her own. Meena had been through a ton of things that would have been hard for anyone to deal with, and she had to do them on her own. It was great that she found some good friends to make everything work out even better. I loved the way these women work together in this one. I’m really hoping that they each get their very own story so we can know that they are all happy in their lives later on! And, of course, there was Kaleb. His character is one of those great guys. I loved the way he looks after Meena as best as he can from far away. But he knows that he’s going to have to somehow get closer when she continues to get creepy emails from the unknown person. And that part of the plot was crazy. I had no idea who the bad guy was. I was so surprised how things happened. Make sure to read this one, you won’t want to put it down! 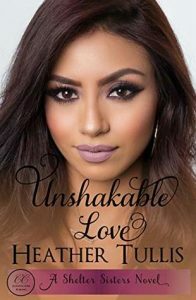 I was sent an e-copy of Unshakable Love as a gift from the author. All opinions are my own.